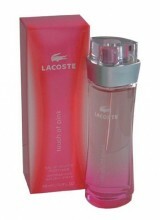 Ladies Perfume - Lacoste - Lacoste Touch of Pink 90ml EDT Spray. Lacoste Touch of Pink perfume is a chic, youthful perfume excuding femininity from its pink bottle and sweet, floral scent. Fruity top notes of blood orange, coriander and cardamom fuse with floral mid notes of jasmine, violet leaf and carrot seed. Base notes of sandalwood, musks and vanilla complete this sensual, feminine and sweet perfume. Perfect for the energetic, positive woman lacosta Touch of Pink perfume is suitable for daytime and evening use. Click the button below to add the Lacoste Touch of Pink 90ml EDT Spray to your wish list.